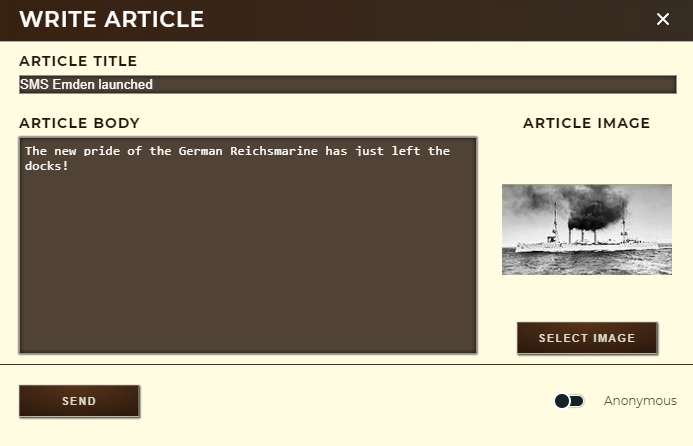 Supremacy 1914 is as much about diplomacy as it is about armed combat. Since you cannot afford to support multiple frontlines at once, you will have to entertain diplomatic relations with other players. 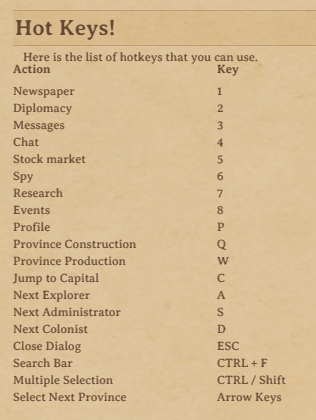 These can be managed via the Diplomacy menu which can be accessed from the main menu. The Diplomacy window is divided into two parts labeled Information and Messages & Trades. Information shows a list of all countries in your game and some useful information like the number of provinces they control, their current score, their status, your diplomatic relation and an option to get in touch through the in-game messaging system. You can sort the list by each category to get a better overview about what is going on in your round. The Activity status, for example, is useful to identify whether a player is active, inactive, or run by the AI/computer. If a human player stays inactive for 3 days, the AI takes over until that player returns to the game. Changing your relation to a player can be easily done by selecting the respective relation from the drop-down menu under Your Relation. Note: Some relations have to be confirmed by the other player in order to be activated. In total there are 6 diplomatic relations between countries. By default, peace is the initial condition and can be changed at any time by both sides. Right of Way allows your armies to move through the territory of the other player without being attacked (and vice versa). Also, you can jointly fight other players' armies. Shared Map lets you share your view of the map and units with your ally and also grants right of way. Shared Intelligence works exactly like Shared Map, but with the additional benefit of sharing the map your player shares with other players. This relation is reserved for Members of the High Command. Note: Countries that are controlled by the AI do not actively engage in diplomatic activity (like declaring war or imposing a trade embargo). However, they respond to your actions: If you share Right of Way, it will probably also be offered to you after some time. The Elite AI differs from the regular AI in being hesitant about such changes, though. Also, it tracks your diplomatic and military activity and offers/refuses relations based on your reputation: If you have a good reputation the A.I. will grant you right of way, but if it is low it may declare war. 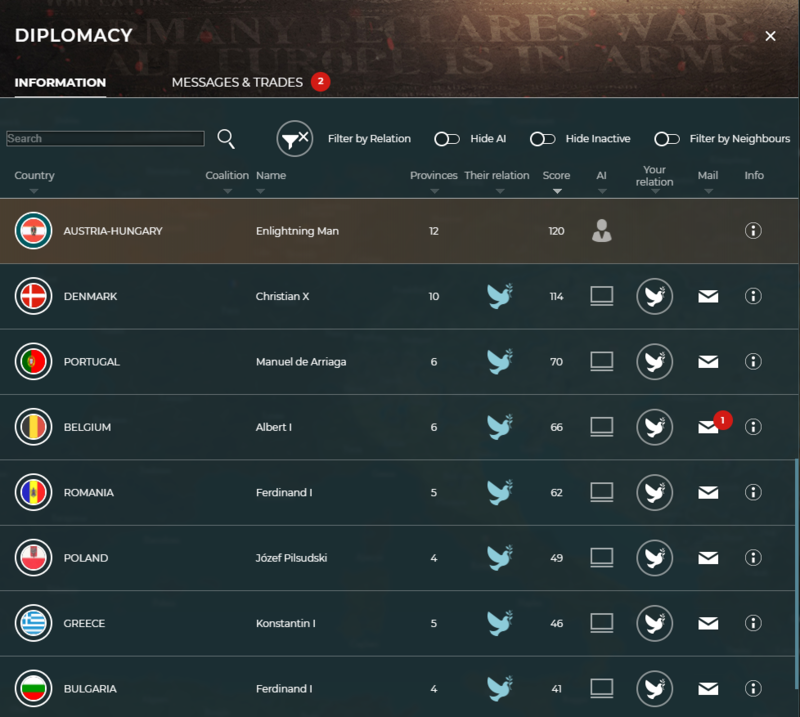 In addition to the information found in the Diplomacy screen, you can select a second tab: Trades & Messages. Here you'll see all countries with which there has been a diplomatic exchange as well as the messages and offers sent between those countries and yourself. As soon as a new message or a new offer arrives, you will receive a notification on the main screen..
Resources lets you trade money (capped at 100,000) as well as all of the five basic resources (capped at 30,000). Relation lets you trade all relations except for "at war". Province lets you trade any of your provinces. Explored map lets you trade all exploration information that is at least 5 days old. Trading can become a crucial aspect when teaming up with players or solving diplomatic crisis. Make good use of it to further your diplomatic or military causes. The "Daily European" (or Newspaper) is your main hub of information about the game and what is happening in your absence. Make sure to check it regularly to keep track of building constructions, official government statements and war casualties. In addition, you will find useful statistics about the game round, a list of hotkeys and much more. The Daily European is published once per day and always shows the current date (you can check it on the top right). However, you can browse through past entries using the arrows on the top left or by just entering the respective day number manually. The top half of the newspaper also shows you the following crucial game information. 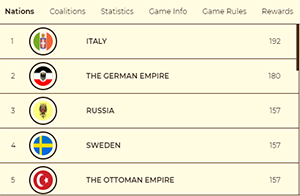 The Index of Nations shows an overview of all players as well as the number of Victory Points they have accumulated. The Map on the right also is updated once each day and gives you a visual overview about territorial changes and conflicts across the globe. The Stats tab cycles through different useful statistics in real-time (e.g., the wealthiest nations, the most active explorers, the most technologically advanced nations etc.). Each day, different categories are featured. The Game Info tab informs about the victory condition of each round (i.e., how many Victory Points are needed to win), the remaining time until day change, and any special rules that apply to the game round. Hint: Some game information is also represented in the bottom part of the newspaper, typically as the first and last entry of each day. This includes a list of Hot Keys, information about players becoming inactive or a change of the game admin role. The sum of 2000 relative victory points is permanently divided amongst all players. If a player becomes proportionately greater, he will get a larger share of the available basis points currently in the game. As the victory points in the daily European are calculated relatively, at the same time the number of winning points for the other players falls. (Basis points are not visible in the game and are displayed in the background of the calculation of the relative victory points). Keeping an eye on these reports is crucial for understanding the occurances on the map and help explain drops in morale, malfunctioning buildings, or 'disappearing' troops. The "write article" button gives you the possibility to write articles, which will then appear directly in the Daily Gazette. This can be a strong diplomatic tool, articles published from there can be read by all players. However, choose your words wisely: Published articles can have serious consequences, so try to avoid insulting or exposing other nations or their leaders. Should you find yourself in the possession of classified information you still want to inform the other players about, you can hide your identity by sending the message as 'anonymous'. Such articles will not be published as an official government communiqué and their origin concealed. Coalitions are a special form of diplomatic relation. A coalition is a good opportunity to interact and communicate with allies. It grants you many advantages like an own chat or a ranking of all coalitions on this map. As a team you can display your flag and become the most powerful coalition. In the coalition window you can find all existing coalitions in this game. To create an own coalition, click on the button on the top right. Then you can enter a name and a description and upload a flag. Please use a rather small image size for that. Unfortunately it is not yet possible to invite other players. They have to apply for it themselves. To apply for a coalition, click on the info button (i) on the right side and hit the Apply button afterwards. The coalition leader will then decide about the applications. To leave a coalition, just click on the ‘My coalitions’ tab and hit the Leave button.